Spend $200 Get a $20 Gift Card, $500 Get a $50 Gift Card, and $1,000 Get a $100 Gift Card. Why Choose JEGS branded products? Manufactured to Highest Quality Standards. Provided By a Trusted Brand Synonymous with High-Quality Performance, Value and Dependability. Need it Sooner? This similar item ships today! Find a lower price somewhere else? Enter product and shipping information below to match the price when you checkout. JEGS will validate the price match before the items are shipped. The price match guarantee does not apply to refurbished, closed, or close out sales. JEGS reserve the right to determine the eligibility of all price matched items.Cannot be combined with promo code offers. Moroso throttle cable mounts are very helpful when hooking up the throttle cable to the carburetor. 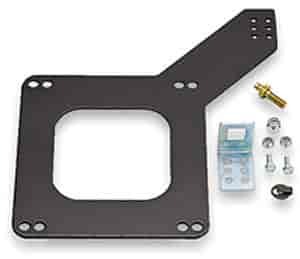 The throttle cables are universal and are designed to bolt to the plate separately instead of stacking up on the carburetor studs. WARNING: Motor vehicles contain fuel, oils and fluids, battery posts, terminals and related accessories which contain lead and lead compounds and other chemicals known to the State of California to cause cancer, birth defects and other reproductive harm. These chemicals are found in vehicles, vehicle parts and accessories, both new and as replacements. When being serviced, these vehicles generate used oil, waste fluids, grease, fumes and particulates, all known to the State of California to cause cancer, birth defects, and reproductive harm. WARNING: Some dust created by power sanding, sawing, grinding, drilling, and other construction activities contains chemicals known to the State of California to cause cancer and birth defects or other reproductive harm. Some examples of these chemicals are: lead from lead-based paints, crystalline silica from bricks and cement and other masonry products, and arsenic and chromium from chemically treated lumber. Your risk from exposure to these chemicals varies, depending on how often you do this type of work. To reduce your exposure, work in a well-ventilated area and with approved safety equipment, such as dust masks that are specially designed to filter out microscopic particles. WARNING: The wires of these products contain chemicals known to the State of California to cause cancer and birth defects or other reproductive harm. Wash hands after handling. EMAIL SPECIALS! SIGN-UP AND SAVE. Thank you! You are now signed up to receive great E-Mail Offers! Sign-Up for your free catalog!